PHOTO: Aerial view of Riu Palace St. Martin. Are you looking for the perfect place for a dream vacation? The Riu Palace St. Martin, located in the spectacular cove with white sand and turquoise waters of Ansel Marcel, welcomes its visitors to enjoy a natural reserve with its unique flora and fauna and also its dream-like beach, ideal for relaxing and practicing water sports. This luxurious all-inclusive, 24-hour resort has 252 beautiful rooms, an exceptional seafront location and an exclusive marina. No matter if you are enjoying your holidays island hopping around the Caribbean, just moored your yacht at the Riu Palace St. Martin beautiful marina and enjoy a whole day at the resort for a small fee Day Pass! You will not regret it. Families will appreciate the kids miniclub, dedicated children’s pool section and varied activities program; while active couples and singles are sure to take advantage of the varied water sports including snorkelling and scuba diving, Aqua Gym and state-of-the-art fitness facilities. Plus with an on-site spa, infinity pool, lavish suites, daily champagne breakfasts and choice of informal and à la carte dining across three restaurants it’s perfect for honeymooners too or those simply looking to unwind and be pampered in a tropical beach setting. The hotel restaurants will delight its customers with a wide variety of flavors from the rich and colorful Caribbean cuisine to the international dishes prepared daily by chefs. The main buffet is the Le Marché restaurant, which offers international cuisine and stations with freshly cooked dishes. There are also three speciality restaurants: the fusion restaurant Krystal, the French La Mer and the L'îlle steakhouse. Guests can enjoy a snack at Calypso's as well as refreshments and cocktails at the pool bar Coco's Bar or the Daiquiri lobby bar. The entertainment programme offers sporting and leisure activities during the day, and live music and shows at night. St. Martin is an exclusive and unique destination where tourists can visit its French and Dutch colonies in the same 37 square miles. Nothing less than 87 nationalities and 27 languages together in a spirit of neighborly cooperation and mutual friendship for almost 350 years. This paradisiacal island is the perfect destination for travelers who want a few days of relax, beach and sun, offering tranquility and fun alike. With its famous beaches, climate and kind local people, St. Martin has become a highly popular international destination. The island offers a range of high-quality restaurants with the finest dining experiences anywhere in the Caribbean, luxury hotels and leisure activities. Additionally, the beauty and richness of its waters make it a paradise for snorkelling lovers. 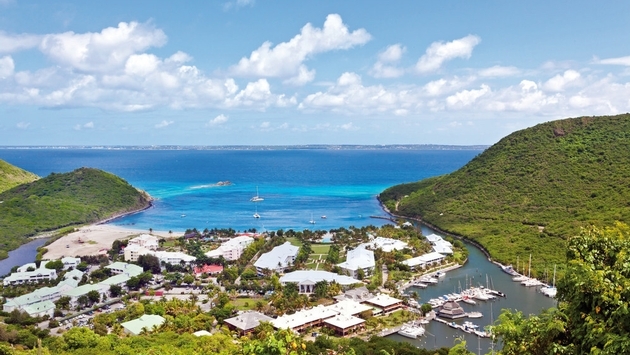 Most Caribbean cruises make a stop here and is a perfect hub to being a DIY island-hopping trip to nearby islands like Anguilla, St. Barts or Saba. Originally from Spain, Virginia Casado is based in Cancun, Mexico, where she works as Press Manager in America at RIU Hotels & Resorts. For more than six years she lived in Beijing, China, working as a TV reporter for Mexican and Spanish speaking media. Thanks to her journalist career and her passion for knowing other cultures, she has traveled across the world and visited more than 30 countries. However, she prefers to “experience a place” than just visiting it because “a real traveler never feels like a foreigner". Her motto? “To travel is to live”.